Sunglasses are pretty much a staple item for me to wear all year round. They’re essential for keeping the sun out of my eyes when driving, sunbathing and walking around outside and they instantly make my outfits look more pulled together and chic. Sunglasses are also an absolute lifesaver for me as I rarely get enough sleep so popping on a pair can help to hide tired eyes… or the hungover look of a late night if I’ve been out the night before. One of my favourite places to shop online for sunnies is the Sunglasses Shop. I like to add a new pair to my collection each year to refresh my collection and to keep up to date with the latest styles and this website is always one of the first places that I look. You might remember my Polaroid sunglasses review and my post about my favourite RayBan aviators, both of which were from Sunglasses Shop. The great thing about their website is that they carry all of the designer brands that I absolutely love from Chanel and Dior to Miu Miu, RayBan and Tom Ford. Each pair is described in detail with full measurements and the price is clearly displayed which is great as some people can find it a daunting experience going into designer stores and asking the cost of an item. The Sunglasses Shop have such a wide price range across all of their items, I’m always really surprised to see how affordable some designer pieces are. My newest pair of sunglasses are by American brand, Guess. 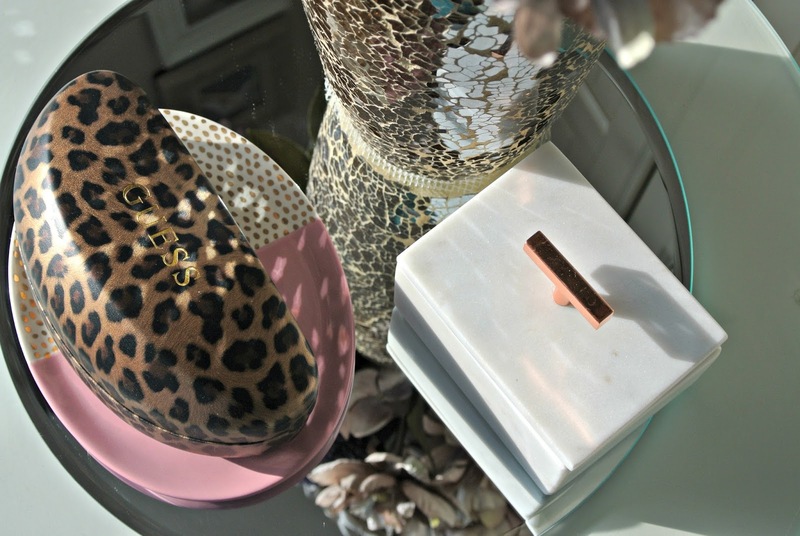 I have a few accessories and a watch from Guess and what first struck me when the glasses arrived was their gorgeous leopard print hard case. I bought a watch by them many years ago and the strap was leopard print too which makes me think that perhaps animal print could be a theme that they carry through many of their pieces. Regardless, I love that the glasses come with a hard wearing case and cleaning cloth. I’ve said on many occasions that I don’t baby my things, I don’t keep many things for best as I like to thoroughly wear and appreciate my things. With that in mind, a chunky, hard case like this is ideal for me as I can chuck it in my bag or car without worrying that the glasses inside are going to be damaged. The glasses themselves are the Guess 7208 Tortoise and Light Green Sunglasses TO-34F* but all you really need to know is that they’re gorgeous (and the link to where you can find them of course!). These glasses are very much all about business in the front and a party on the sides. They combine so many of the latest trends into one single frame that I’m sure so many women will love them. It was the shape that first attracted me to them. They have a gorgeous upswept shape the them which is really flattering on so many face shapes, which also makes them a fail safe style to buy online as the chances are, they’ll suit you. They’re oversized without being too big and I love the brown tortoiseshell colour which I think is so complimentry to all skin and hair colours. It is a lot softer than black, especially on blondes. The lenses are dark brown too which is my preferred tint and they’re in a tough polycarbonate to help to reduce the risk of them scratching or breaking. They’re fully UV400 protective too so they’ll protect your eyes from the suns glare; very important regardless of how strong the sun is in your country. When you’re wearing these glasses, head on they look chic and sophisticated but turn your head to the side, and they’re all about fun and trends. The arms are a vibrant mint green which gold detailing in the form of little metal pyramids/studs either side of the subtle GUESS branding on either arm. I really love this combination; its tough, luxe, edgy and fun at the same time. From the first wear, I knew that these sunglasses were a great fit. They feel so comfortable and light weight to wear, they sit and stay on my face when I’m moving around, without falling off and I love that I can pop them up on the top of my head without them getting caught in my hair. Priorities, girls! All glasses from the Sunglasses Shop come with either a one or two year warranty, these particular ones have a one year manufacturers warranty for extra piece of mind when buying them. They’re very well made so I cant see me having any problems as they feel really robust and high quality. These particular sunglasses are available here for £67 which is a saving against the RRP and I think that they would be worth every penny; I would certainly recommend them to you if you’re in the market for some new sunnies and I’d definitely suggest checking out the Sunglasses Shop. My favourite thing about shopping with the Sunglasses Shop is that their customer service is superb, so much so that I’d choose ordering the same pair of glasses from them over any other retailer. They offer free delivery, easy, free returns with up to a year to return all except sale items, a freephone number for queries and an online chat facility for help and advice. Can’t say fairer than that! You can shop the Sunglasses Shop site for both men, women and kids here. They also have goggles and prescription options too! Those sunnies are lovely. I've always loved Guess as a brand. These are a great shape for your face – that sounds weird but you know what I mean! I love the pop of colour on the arms! I have about 20 pairs of sunglasses now, but I still want to go and buy more at the weekend. You can never have too many! I love these sunglasses, I have never owned an expensive pair, as I am terrible with glasses and always losing them. The sunglasses look really smart and very stylish. They look great, and dark brown is my preferrent tint as well. They're super cute! I adore the mint frames, for me that is the best part of the sunnies and it is great that they offer designer brands at discounted prices too!